Olukunle Adetunji was deported to Nigeria in 2014 and came back to Canada two years later, only to be found out and detained. After his release, he says all he wants is to be with his family. Olukunle "Olu" Adetunji first came to Canada from Nigeria in 2012. Not long after, he met his wife Kimora and her two kids. "When they first met him, before we were married or anything, they loved him because he's like a big kid," Kimora told Out in the Open host Piya Chattopadhyay. And so, Adetunji moved in and the couple got married. "We had like a perfect, TV household," Kimora said. "Like a sitcom household. It was a lot of fun. All the kids got along, all the adults got along, we all did everything together. So when he was deported it was really hard to see him ripped out of what we had built." Adetunji was deported while Kimora was pregnant with the couple's first child together. His claim for refugee status had been denied, as was a pre-removal risk assessment that followed the initial deportation order. But with Kimora on doctor-prescribed bed rest during her pregnancy, Adetunji had not left Canada. "I never saw it as breaking the law," he said. "I just saw it as a man that was just trying to be with his family. She's on bed rest and I was asked to leave my wife and the children. What would a man in his right state of mind do? Leave or stay?" Kimora said she knew it was only a matter of time until her husband was sent back to Nigeria. "Looking this way, looking that way — it's no life," she said. "But at the same time, it's no life to be married and then he's halfway across the world and I'm over here. You can't consciously make a good decision when you don't really have options in that situation." And so, in 2016, Adetunji was deported back to Nigeria. Adetunji left Canada without meeting his unborn son. "He was a Facetime dad," said Kimora. "That's how we would interact with each other. He would look at him grow… over the internet. Never got to touch him, didn't know how he smelt. Never changed his Pampers. There was a lot of detachment." Adetunji said he applied for a visa to return to Canada — if only to visit — three times, but was repeatedly denied. Finally, Kimora brought the couple's newborn child to Nigeria to meet his father. "Being with my son actually instilled my manhood back," Adetunji explained. When they left, he decided he'd return to Canada — visa or no visa. When asked about re-entering the country illegally, however, Adetunji objects. "The only thing that brought me back to Canada was love. Love brought me back." For her part, Kimora sees nothing wrong with her husband's actions. "Every person has the right to seek refuge," she said. "If I get an opportunity to seek refuge here, it's my human right. So he came here to seek refuge. He did not come conventionally, but he came." Without authorization to be in Canada, Adetunji could not work and was at constant risk of being deported again. What came next, however, is something he feels was even worse. Adetunji was discovered and placed into immigration detention, in a series of medium/maximum security correctional facilities throughout Ontario. "Detention is not a good word," said Kimora — referring to the conditions in which her husband was held for more than 10 months. "He was put in jail," she insisted. "He was imprisoned without cause." ​Unsure how long Adetunji's detention might last, the couple told the children that their father had moved to another province for work. "When kids are taught about what jail is it's because you did something bad and the police came to get you," Kimora said. "Imagine explaining that to a child." Ultimately, Adetunji was released from detention. His lawyer, Macdonald Scott, told Out in the Open that with Nigeria unwilling to issue the documents required to deport Adetunji once again, he might have been detained indefinitely — if not for a reasonable adjudicator presiding over one of his monthly detention hearings. 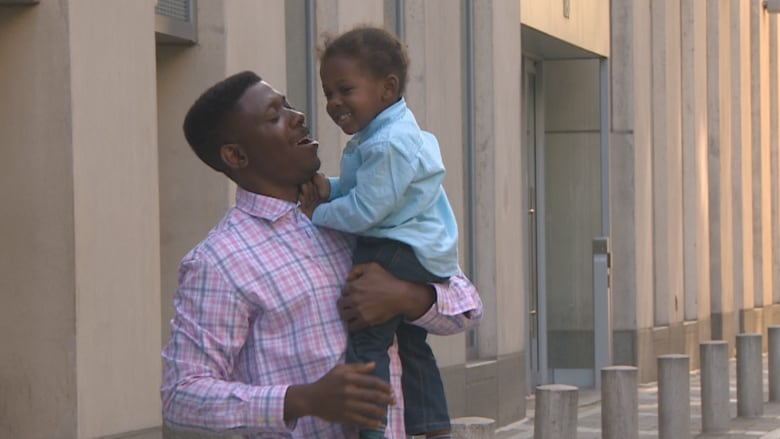 Scott and other advocates with the End Immigration Detention Network are calling for Immigration, Refugees and Citizenship Canada to place a 90-day limit on immigration detention, so that families like Adetunji's aren't left wondering how long their separation might last. Meantime, Kimora says their family's story is a reminder to Canadians that they should look to their own borders. "Donald Trump did not invent the separation of families by immigration detention," Kimora said. "We're doing it over here. Families are being detained… If you're outraged about what's happening in the United States, get outraged because it's happening right under your nose." This story appears in the Out in the Open episode "Parent-Child Seperation". Refugee parents can bring their kids to Canada, so why can't kids bring their parents?